The Bottom Line: Expect the warmest temperatures of the winter, so far. Warming, sun, and uncertainty of how the snow will respond at upper elevations is keeping the danger heightened. If you are heading to higher slopes, use caution on slopes 35 degrees and steeper. Stay off of steep slopes if you see shooting cracks in the snow or experience collapses. With warming and sun, there is uncertainty about the snowpack at upper elevations. 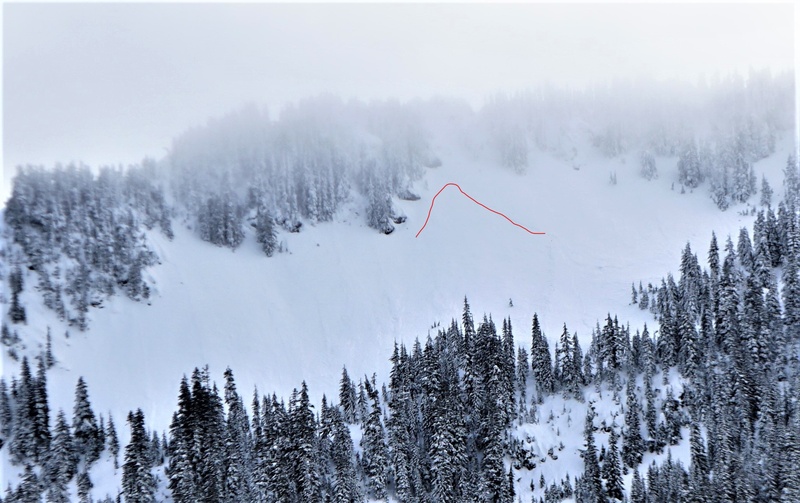 Most loose wet avalanches are a few days old. 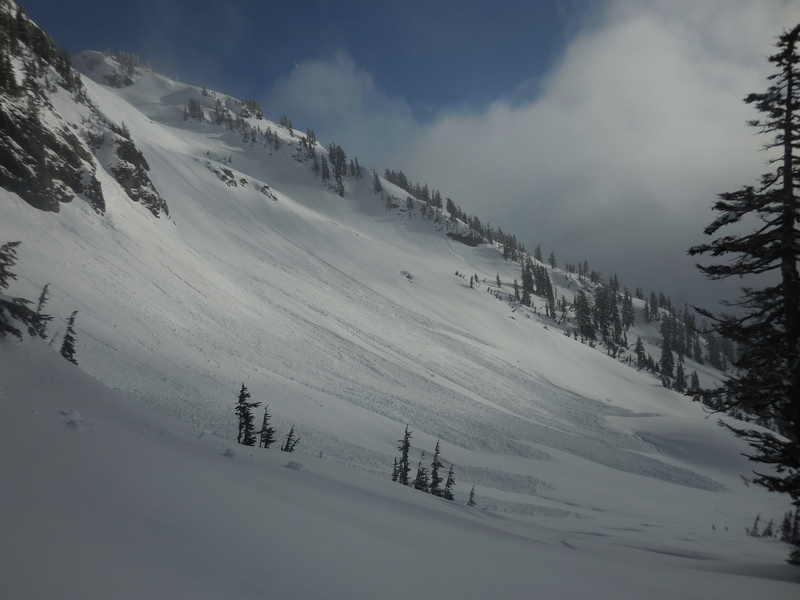 Watch for wet avalanches if you see soft, wet snow on sunny slopes and at low elevations. A storm on the 23rd caused a widespread natural avalanche cycle throughout the Cascades. Many large paths ran in the area, entraining wet snow as the debris ran through the water saturated lower elevation snowpack. Most of these appear to have ran within the storm snow, but some may have taken out persistent weak layers. Natural slab avalanches were report as recently as Friday in the Wenatchee Mountains. It rained up to around 5,500ft, but this didn't affect deeply buried weak layers. Check out the Regional Synopsis tab for details on the storm and avalanche activity. Large avalanches will be easier to trigger after the recent storm added to the slab over the weak layer. You may be able to trigger avalanches more easily in the Wenatchee Mountains. East of Hwy 97, the main concern lies in triggering the whole snowpack to the ground. Here, the snowpack is shallow and largely variable. Avoid areas with thick slabs adjacent to thin, rocky slopes. Further west, the main layer of concern is a layer of surface hoar that was buried on the 17th. You can find this layer down a foot or two below the surface. Look for shooting cracks, and listen closely for whumphs. Snowpack tests can also help identify these weak layers. Lack of evidence in one profile or test often isn't enough information to make sound decisions from. Minimize exposure to large, steep slopes. Put a large buffer of terrain between where you travel and any steep slopes. Another warm, sunny day will keep concern for triggering recent wind slabs. Where snow has been drifted, dense slabs have formed. More freshly drifted slabs are the easiest to trigger. When you find more than 6” of snow has drifted in or accumulated, it’s time to evaluate it. You can check how the new snow is bonding by using small, inconsequential test slopes and quick hand pits.